Furlong's negotiating skills have helped Gilman remain affordable for local families. The Will J. Hancock Unsung Hero Award is given to business officers who have made extraordinary contributions to their schools and exemplify exceptional integrity, knowledge and motivation. At the end of each school year, new Unsung Heroes receive their award from their head of school, often at a significant school occasion such as a board meeting or an all-school ceremony. What makes these Unsung Heroes so special? The highlights below come straight from their colleagues' nominations. See a full list of the 2018 recipients. Stay tuned to NetAssets.org for additional profiles. Superpower: Cost controller. Furlong has been instrumental in keeping Gilman's tuition affordable while maximizing value. Working with other schools in the community, he negotiated rates for key services like health insurance and dining while continuing to provide robust employee benefits. Quiet strength: "Sean has been one of those servant leaders who quietly goes about his work excellently, staying under the radar... [His steady hand] makes it easier for heads of school to focus on their work on leading the organization... Winning this award won't change Sean. It won't go to his head; instead, he will continue to press on, doing the work of helping Gilman to remain a great place to work and learn." After School: Furlong teaches at Johns Hopkins University in the evenings. 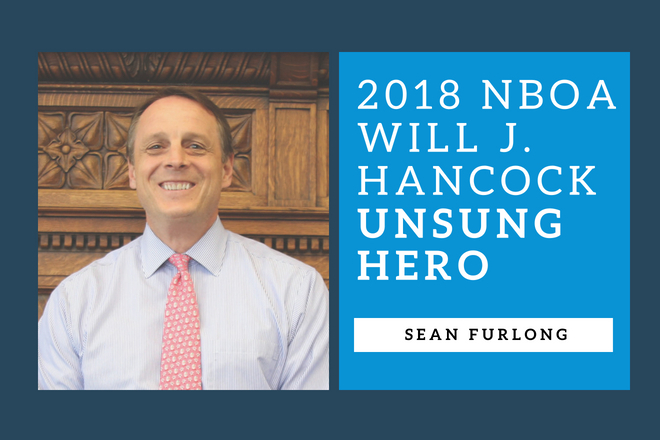 See a full list of the 2018 recipients and read more about the Will J. Hancock Unsung Hero Award. NetAssets.org will post additional profiles of Unsung Heroes throughout the fall — check in to learn more about other recipients.